The Wean the Weans app has been developed by NHS Lothian (West Lothian Eatright project) in partnership with West Lothian Council Regeneration Team, Blackburn Early Years, and with the support from NHS Lothian Community Nursery Nurses, Health visitors, West Lothian Council Sure Start and many parents. It was developed by Bravelocation Software Ltd. 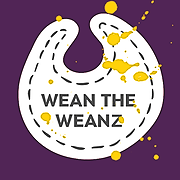 The Wean the Weans logo and drawings were produced by AK Design (SCOTLAND) Ltd. Thanks to all staff and parents in West Lothian who contributed to research on weaning which led to the development of this app. Thanks to all staff and parents who provided the inspiration for the app design and content and were involved in the development and testing of the app itself. Thanks to NHS Lothian Information Governance Team, and IT teams for providing guidance on security and privacy aspects of the app development. Thanks also to the Frist Steps Nutrition Trust for providing some of the content. Thanks to Waracle Mobile for support in finding a suitable developer. App Icons courtesy of Icons8.